This is a nationwide multi-media and multi-platform campaign featuring 20 exceptional Kenyan scientists, researchers, practitioners, innovators, educators, tinkerers and makers of all stripes. Our profiled scientists not only challenge stereotypes around science, but also showcase the many hidden ways that members of our society engage in science and the influence it has over many aspects of our daily lives. The campaign will also feature interesting facts about Kenya’s long history of excellence in science, connecting the public both to Kenya’s scientific past and its scientific future. All ASW-Kenya event attendees stand a chance to enter the Johnson & Johnson 'Champions of Science Storytelling Challenge' and win $5,000. Click here to learn more. We’re kicking off Africa Science Week - Kenya with an invite-only launch event in Nairobi. Our campaign launch will feature scientists from our 'Faces of Kenyan Science’ campaign, showcases by young innovators, and an opportunity to network with the who’s who in Kenyan science. Guest list closed. ln ‘Tech Talks Back,’ we moderate a lively debate on the state of Kenya’s technology sector with leading tech players to discuss the state of Kenya’s booming technology sector. Keeping in mind that the country is young, growing and connected - almost 70% of Kenya’s population under 35, it's economy is one of the fastest growing in sub-Saharan Africa, and it has over 30 million mobile data and internet subscriptions – our panelists will discuss the Silicon Savannah’s players, prospects, and problems. During Tech Talks Back, we ask, who supports Kenya’s technology sector and who holds it back? Where is disruptive innovation taking place? Can the tech sector address intractable challenges such as poverty or does it only distract us from tackling deeper problems such as corruption, weak institutions, and poor infrastructure? And with 90% of disclosed investment going to startups with one or more expat founders, are Kenyan players merely at the margins of Kenya’s tech revolution? Save the date for this hot-topic discussion: Tuesday, December 4th from 7:30-9:30 PM. RSVP by clicking here to claim your spot! Then join us Wednesday December 5th from 7:30-9:30 PM for ‘Stories Behind the Science.’ A storytelling event that delves into the phenomenal, glass ceiling-breaking and truly grueling moments of making it in the field of science as a woman. Hear the stories of five women who have found success as scientists and are part of the ASW-Kenya ‘Faces of Kenyan Science Campaign.’ The women will undergo intensive training in storytelling inspired by techniques pioneered by The Moth. RSVP by clicking here to claim your spot! Demystifying and making math fun is no easy task, but the folks at Africa Maths Initiative (AMI) are up for it. 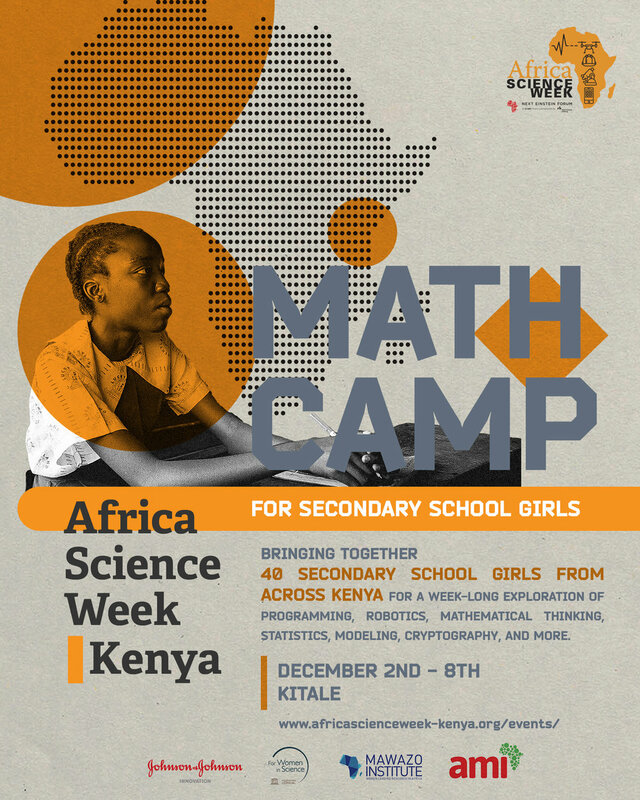 As part of ASW-Kenya, AMI are organizing their first ever Maths Camp specifically for girls. The event will bring together 40 secondary school girls from across Kenya for a week-long residential Maths Camp led by maths experts and local volunteers. One teacher from each school will also be invited to join the camp and gain exposure to innovative teaching methods and resources. Our students will explore programming, robotics, mathematical thinking, statistics, modeling, cryptography, and more. They will also have the opportunity to learn how to use computers and the internet to do research. This invite-only breakfast targets early career women from different Science, Technology, Engineering and Math (STEM)-related sectors. The Leadership Breakfast will feature a moderated panel discussion with five senior women professionals sharing their experiences and insights from their careers in science, followed by an interactive networking session. 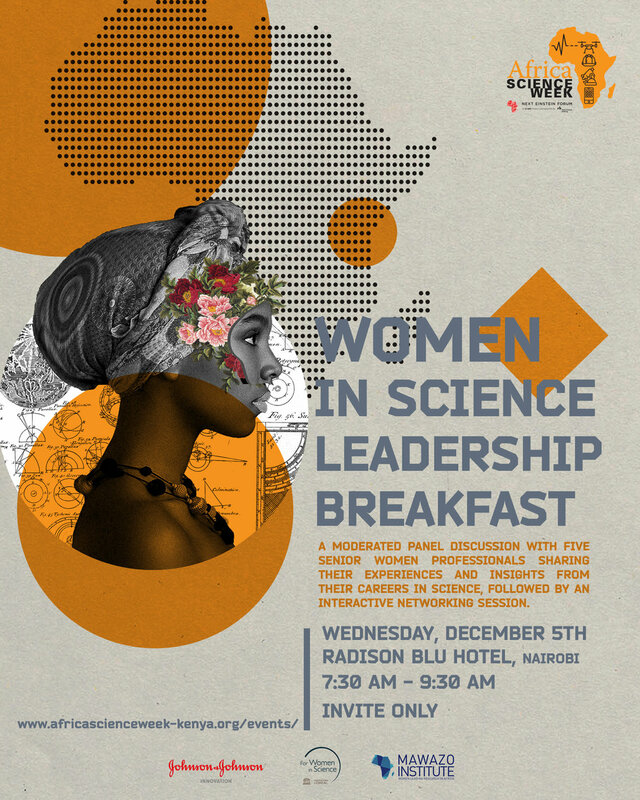 In a career dominated by men, ASW-Kenya will gave a rare opportunity for African women in science to network and discuss topics of mutual interest toward the advancement of their careers. Guest list closed. ASW-Kenya is supporting the initiative by providing funding support and guidance for a new research module at the camp which will teach the student participants basic research methods.